Protect sensitive circuits with this on/off key switch. When we have received the item back it will be checked to confirm the fault. Supplied with Two Keys. Colour: Nickel. Heating & Cooling. High Quality Nickle Finish. Actuator: Barrel Key (All keyed Alike). Key Pull: ON or OFF Position. Key removable On or Off. Lock body length 1 1/8". 2 keys per lock;. Below is the link for locks with black key cover. Tubular Switch Lock. it is not "paint" - it is E Coating, Electro Coating under RoHS. Springs back from ON position. Single Pole, Single Throw. 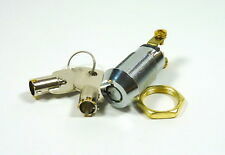 Key switch includes two matched tubular keys, washer and a plastic key switch cover. 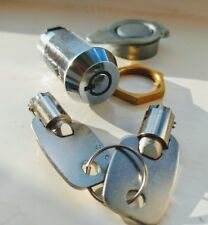 Tubular security key switch with two keys, washer and plastic key switch cover. Philmore 30-10078 Key Switch. Key Pull: on/off position. Sold as 1 switch per lot. The Key can be pulled while in Either the OFF or ON Positions. This Key Switch has 2 Maintained Positions: OFF ~ & ~ ON. 3/4" (0.750") Round Hole Mounting, Panel Thickness up to 3/4" (0.750"). Keyed Differently. Key turns 90 degrees clockwise maintaining (not spring loaded). Add to Favorites. This Key Switch has 2 Maintained Positions: OFF ~ & ~ ON. The Key can be pulled while in Either the OFF or ON Positions. 3/4" (0.750") Round Hole Mounting, Panel Thickness up to 5/16" (0.312"). 1 Round key per lock. Keyed alike #2205. Includes one key, red key cover and red lock indicator. Key is removable ONLY in the OFF position. Keyed alike;. Lock body length 1 1/8". 2 keys per lock;. Below is the link for locks with black key cover. Lock body length 1 1/8". 2 keys per lock;. 400pcs all keyed alike, with black key cover. Below is the link for locks without black key cover Fits in 19mm x 17mm mounting hole; Hex Nut mount. Tubular Switch Lock 6PCS. Main body material: Zinc alloy Housing and Barrel. 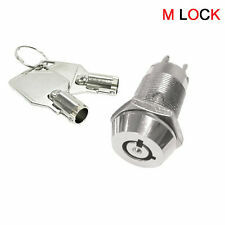 2 Electronic Key Switch Lock Off/On Lock Switch Security Tubular Chicago Lock. Condition is New. Shipped with USPS Priority Mail Small Flat Rate Box. 100pcs all keyed alike, without black key cover. Keyed alike;. Lock body length 1 1/8". 2 keys per lock;. Below is the link for locks without black key cover. 400pcs all keyed alike, without black key cover. Keyed alike;. Lock body length 1 1/8". 2 keys per lock;. Below is the link for locks without black key cover. 500pcs all keyed alike, without black key cover. Keyed alike;. Lock body length 1 1/8". 2 keys per lock;. Below is the link for locks with black key cover. Tubular Switch Lock 100PCS. All keyed alike, 2 keys per lock. Main body material: Zinc alloy Housing and Barrel. You are buying ONE Anti-Static Switch-exceeds C&K Switch 20KV DC static resistance Y Series 4A 125V. 25pcs all keyed alike, 2 keys per lock. Keyed alike;. Lock body length 1 1/8". 2 keys per lock;. Below is the link for locks with black key cover. We will make every attempt possible to resolve the issue if we made a mistake. Let us know if our service could be better! Manufacturer: PHILMORE. Uses barrel key which can be removed in both positions. Their Datak line includes dry transfer products, wire markers and printed circuit making products. Part Number: 30-10078. Manufacturer: PHILMORE. Key removable in OFF Position only. Their Datak line includes dry transfer products, wire markers and printed circuit making products. Part Number: 30-10076. Dielectric Strength: 1500V AC for 1 Minute. Key Pull: ON or OFF Position. Actuator: Barrel Key (All keyed Alike). Key removable On or Off. Includes 2 keys. 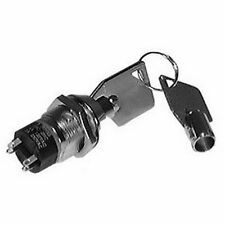 You are buying ONE TUMBLER Switch C&K Switch, Y1011C2C2WCNB, SPDT, ON-ON, KeyPull 20VDC 0.4VA Wire. Key Lock SPDT 90° Flat Key 20VAC 20VDC 0.4VA Wire Lead Panel Mount. BIN # E4E-BAG-09. HIGH SECURITY TUBULAR ON/OFF SWITCH LOCK. Security system. 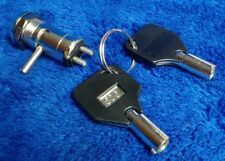 1pcs lock with 10 keys in total with black key cover. Security system. 6 Keys per lock. 4 keys per lock;. Lock body length 1 1/8". Below is the link for locks with black key cover. 6 keys per lock;. Lock body length 1 1/8". Below is the link for locks with black key cover. 200pcs all keyed alike. Keyed alike;. Lock body length 1 1/8". 2 keys per lock;. Below is the link for locks without black key cover. 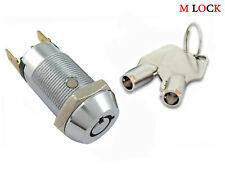 Tubular Switch Lock 70PCS, 2 KEYS PER LOCK, ALL KEYED ALIKE. Main body material: Zinc alloy Housing and Barrel. F Type In-Line to In-Line Coupler. Filter Gel. Eagle 1U 19" 24 Port Cat5e Patch Panel. Colour Nickel. LED Tape Light. Steel Vent Panel - Rack Size 1U. Squire Sound & Light has decades of experience in the professional audio market.